Steven Rhodes claimed the Armed Forces Merit Award in 2016. The FWAA helps name the winner of the Merit Award along with the Lockheed Martin Armed Forces Bowl. MURFREESBORO, Tenn. — Middle Tennessee defensive end Steven Rhodes’ incredible four-year journey will come full circle in the next week. Dr. Sidney A. McPhee, president of Middle Tennessee State (left) and Athletic Director Chris Massaro at the FWAA’s Awards Breakfast on Jan. 9, 2017, in Tampa. The senior Marine veteran and Antioch, Tenn., native will accomplish what he calls “two of the biggest goals in my life” all in the span of eight days. He will graduate from college on Saturday with a bachelor’s degree in organizational communication and then attend rookie minicamp with his hometown Tennessee Titans from May 12-14. “Finally my dream is starting to take place,” Rhodes said. “It’s something not everyone can say they’ve done, to graduate college and get a chance in the NFL. Especially not having any student loans, that’s even better. It’s often said that students mold the person they will become during their four years at college, and especially during their freshman year. But, for Rhodes, that was a little different. He wasn’t an 18-year-old kid moving away from home for the first time in his life when he stepped onto MT’s campus in 2013. He was a 25-year-old man who had spent the previous five years fighting for his country as a Marine. 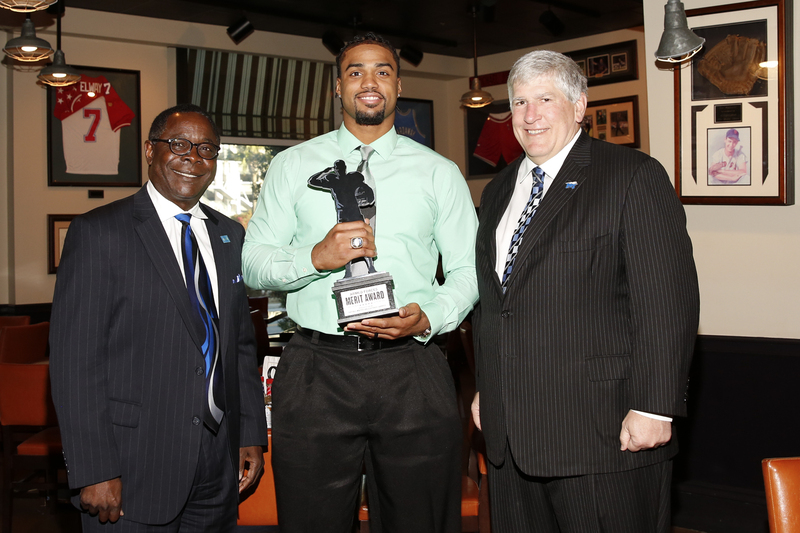 Rhodes became a beloved member of the Murfreesboro community, being awarded the Daily News Journal Person of the Year award in 2013 during his freshman season for the Blue Raiders. He also became a consistent player on the field and got better each season. He had never played defensive end before coming to MT, but improved with every game and every practice and capped his four years with a career season in 2016. He set personal highs in tackles (41), tackles for loss (8), quarterback hurries (7) and sacks (4.5), leading the team in the latter three statistics. How Rhodes was able to focus on his craft as much as he was able to over his four years wasn’t just a credit to his own work ethic. It was a family affair. He and his wife, Adrienne, have two children: Kameron, 5, and Devon, 4. It was their support and flexibility that helped their dad reach his ultimate dreams. As he prepares this week to showcase his talents in front of the Titans, Rhodes will take some time to reflect back on the special four years he’s had. But, sticking true to what he learned as a Marine, he knows there’s plenty of work to do in order to prove himself, and he’s too disciplined to take a break. The Armed Forces Merit Award recipient also knows there are a lot of people from another family, his fellow veterans, who are inspired by his story, and he won’t let them down. “It’s possible to achieve your dreams after active duty, and I’m glad I can show that,” Rhodes said. “It’s been an emotional rollercoaster … but everything worked out how it was supposed to.